May 2017, Cramp Up Tournament, Medford, Oregon. 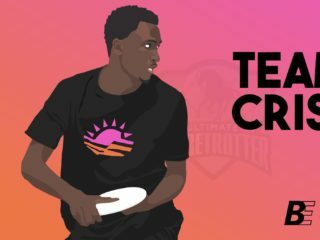 My first full tournament with Cutthroat Ultimate, the local mixed club team in Reno, NV, and really my first tournament as myself. Nearing a year on hormone replacement therapy (HRT), I was finally playing in a tournament as Jenna, as myself – and I was exhausted. Not only was I out of shape from not playing very much during the semester, but we also had only two women cutters at the tournament, low numbers I wasn’t used to coming from the abundance of men in mixed. Despite being gassed, I marveled at the changes that had occurred in the last year and how they have changed how I think about ultimate. I used to never lay-out on the field. It looked hard, it looked like it hurt, and I didn’t feel comfortable putting myself all the way out there to bid and lay-out. Come Cramp Up, however, and I was bidding all over the place in all sorts of situations. So what changed? 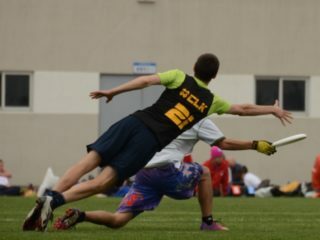 It may be that playing at a higher level of ultimate brought out the lay-outs. Or, what I think is more likely, is that I feel more free now than I did before, and so am more open to laying-out. Pre-transition I was always hiding something, the fact that I was trans, and I think that general reticence expressed itself in ultimate as a reluctance to lay-out, put my body on the line, and be vulnerable. Now well on my way in my transition, I’m more open and free, and willing to put myself out there and my body on the line. I’ve noticed other changes too, these more physical than mental. As I’ve written previously, a primary concern when trying to incorporate trans people into sports is the possible competitive advantage trans women may have over their cisgender competition. Being on HRT is supposed to reduce that advantage, with a year used as the general marker where the competitive advantage of trans women is reduced enough to allow fair competition. Personally, I’ve found this to be quite accurate. 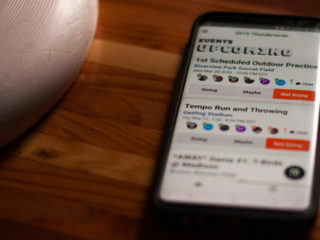 At Cramp Up, I matched up well against the women on other teams and I felt like all the matchups were reasonably fair, certainly more so than if I were to match up against the men. Additionally, no one had any comments or seemed to notice or care. I was just another woman playing ultimate at Cramp Up, which was as clear of a sign as any that I was, and am, fairly competing as a woman. Both Cutthroat and the UNR women’s team, which I played with spring semester, have been extremely welcoming and I’ve received nothing but great support and acceptance. This warm reception extended to the men’s team as well, most of whom knew me fall semester before I started dressing and presenting myself as a woman “full-time.” All were very cordial and understanding, and I heard of no ill comments from anyone on the team. I started playing with the women’s team in January, right around when I began going full-time. Before then I had been presenting myself as a man while I waited for the hormones to really kick in. As soon as I joined the team, I was included in practices and social events and I felt like a real part of the team. Unfortunately, I couldn’t play in sanctioned tournaments since I had not yet reached a year on HRT per USAU policy, so my contributions were limited to the sideline. While the team was understandably disappointed that I couldn’t play in tournaments with them, especially with only a roster of 12, they were more than happy to have another experienced voice on the sideline. I am now eligible to play in sanctioned tournaments with Cutthroat and the women’s team, and I am very excited at the prospect. Despite my prior ineligibility, both teams have fully accepted me as part of the squad and I’m seen as just another woman contributing. While simple, this welcoming and open atmosphere means so much to me. One interesting thing of note that has come to my attention as I’ve started playing with Cutthroat is the consideration of how trans people are viewed on the field, specifically how much trust they get from their teammates. As has been written about fairly extensively before, there are issues with how men and women are perceived differently on the field, particularly with newer players. Women generally end up having to prove themselves to some extent, to show that they can play and be trusted with the disc, both throwing and catching. Men can usually walk onto the field and immediately be trusted to be able to play at least decently, even with zero prior experience. This is obviously a big issue that I don’t have the authority or experience to speak on, but I do want to highlight the question of how this difference plays out with trans people. With trans individuals, especially those who have played ultimate pre- and post-transition such as myself, how do these gendered perceptions of experience and trustworthiness play out? Are trans women who have played before trusted because they previously played as men, or does this only apply to people that know that they are trans and otherwise they have to prove themselves like cisgender women? Conversely, are trans men not trusted even if they’ve played before because they identified as women, or as soon as they transition are they considered men and trusted implicitly? Or do trans people have to prove themselves no matter the situation because of the uncertainties transitioning brings? I don’t have the answers, but this is one of several issues I’ve thought about a lot more playing with Cutthroat and reaching a year on HRT. Another one of the issues I’ve been considering is the balance between working out and being strong for ultimate. Most trans women want to look more feminine, not gaining muscle mass or even losing muscle mass. However, having gone through male puberty we usually have more upper body muscle mass than cisgender women do, particularly if we were or are athletes. HRT does a fantastic job of reducing that muscle mass over time, but it does take a long time and is aided by not working those muscles out, again particularly in the upper body. 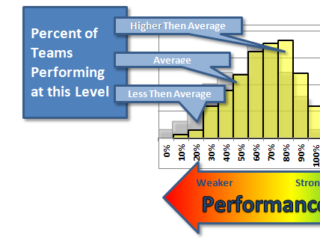 The problem is that ultimate requires upper body strength and club teams like Cutthroat often have weekly strength workouts to do as part of our training. So what to do then as a trans woman? Workout and stay stronger for ultimate and slow down the progress of the HRT and muscle mass loss? Or instead, avoid working out at the risk of injury and being out of shape in season? Or maybe there’s some sort of compromise solution? I’ve been trying to balance it by doing most, but not all, of the workouts and substituting other exercises in when I can that work other muscle groups. It’s been working alright, as I’ve stayed in pretty good shape while not gaining much muscle mass and potentially still losing some very slowly. This attempt at a balance though leads to another issue I’ve had to struggle with: the consideration that I might potentially still have a physical advantage against women. Although HRT is very effective, it takes a number of years to have its full effects felt, so even at a year this leads to some prior characteristics to be retained. For trans women such as myself, this can be discouraging as we feel like we’re still part guy and that’s something we really don’t want to feel anymore. Additionally, that’s the very thing that leads to claims of competitive advantage, so it brings extra weight to an already weighty subject for trans women athletes. How then to deal with this issue? How to feel like more of a woman despite these carried over characteristics? One thing that I’ve done, whether for good or for ill, is hold back in certain situations or certain times. While I know I should be going all out and fully competing always, I also don’t want to appear like I have have any competitive advantage from being trans. I also want to blend in and feel like just one of the girls and I feel sometimes the best way to do that is hold back a little bit. But I also want to compete to my fullest even if I do have competitive advantages for whatever reason, as that’s the most fair to me, my teammates, and my opponents. So what is a trans girl to do, given these circumstances and the surrounding policy and societal issues? The answer is as of yet unclear. I wanted to close with just a quick update on the trans policies in ultimate/USAU. In short, there are no policy updates as USAU has still not updated their transgender policies. This nearly 6 months since they indicated they would begin that process after the World Flying Disc Federation (WFDF) updated theirs. While not strictly a pressing issue, clearer, more coherent policy would be useful as more trans individuals come out and play ultimate. Questions like what happens in the situation of a challenge to a trans person’s eligibility, or is one year on HRT a reasonable and fair deadline for eligibility, need to have concrete policy answers to be able to turn to when issues come up. Although little has changed in the policy realm, it is an encouraging sign that trans issues continue to be discussed. For example, I’ve had conversations with people about the potential for restoring a year of college eligibility to college trans women, since USAU policy requires us to sit ineligible in some form for a year. I was also gladdened to see listed among recommended questions for the USAU Vision Tour a question pertaining to further inclusion of trans individuals in ultimate. Now having finally reached a year on HRT, I am very pleased to say that I am fully eligible under current USAU policy. I’m amazed that I’ve made it this far, and am more thankful than I can put into words for the support and love of all of my teammates. Despite the many different challenges, including mental, physical, and social changes, I couldn’t be happier with where I am today. 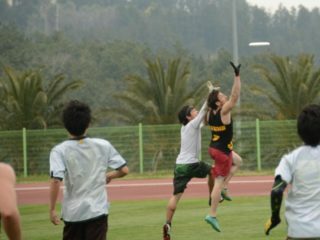 Going forward, I will continue to play ultimate, and be an example and advocate for any and all other trans ultimate players, so that we can eventually have a fair and inclusive sport for all people. You can reach me at weiner2010@gmail.com, or leave a comment below and I’ll do my best to get back to you.